Frankincense has played an integral part in the Omani heritage and culture and has been the main source of income for the Dhofari people for centuries. Frankincense trees have also played important environmental roles: they grow on marginal land not suitable for ordinary agriculture, protect the soil from erosion, produce good biomass and provide shade. Few people know that frankincense is harvested by tapping the trunk and branches of the Boswellia sacra tree. In the past few years and after close monitoring of the growth patterns of frankincense trees, researchers noticed that the tapping has been too harsh, often leading to the degradation of the tree beyond repair. Changes in the climate over the past few years might have also had an impact on the growth of frankincense trees. Accordingly, it was important to monitor these two factors and record their impacts on the sustainability of frankincense farming in Dhofar. Sponsored by HSBC, this long-term research project had, in the past, focused on four experimental research locations in the Governorate of Dhofar and aims to determine the right frequency of cutting to produce a good yield without adversely harming the trees. 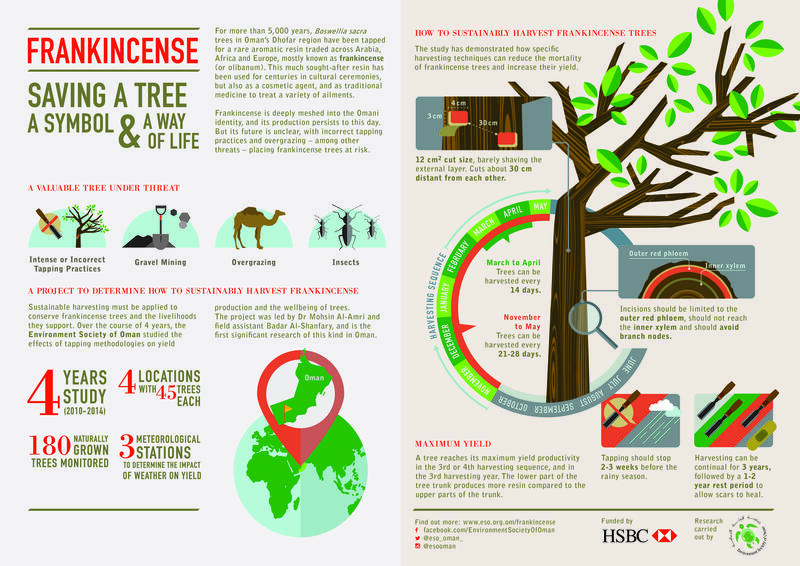 ESO has produced a comprehensive infographic poster, designed to inform farmers on the sustainable harvesting of Frankincense, which is vital to the survival of this endemic tree. A full-scale awareness program will begin in 2016, but workshops and presentations have already begun with local communities in Mirbat, Sadah and Hadbeen to explain the project and its implications.